St. Peter’s mission is ambitious, and yet part of the fabric of who we are as a community. We strive to be One Body of transformation, embracing all people through Christ’s love. There is evidence of this throughout our parish, which includes active members from all over the North America, as well as countries in Europe, Africa and South America. This is a parish that embraces young and old, and everyone in between. We are a parish that votes for Republicans, Democrats and Independents. Our community includes people who hold both conservative and progressive theological views. But while we hail from diverse places, and have diverse ideas, there is one thing we hold in common, and that is the love of Christ, which has called us together in this place as we strive and sometimes struggle to be members of His Body. Just like Christ’s resurrected body, we have some scars and wounds to show. Yet, more significantly, we have an experience of transformation to show and to share with those who elect to join us on our spiritual pilgrimage. The history of how St. Peter’s came to be as it is now is a relatively short history, but it is filled with some remarkable people who have made remarkable contributions to who we are. The history of St. Peter’s Church actually started 155 years before our church was built at the comer of Hudson and Devenger. Between April and June of 1820, the Rev. Rodolphus Dickinson (or Dickerson) established three missions in the Piedmont of South Carolina. A native of Massachusetts, the Reverend Mr. Dickinson had been educated at Yale, and had at first gone into the businesses of publishing and law. At 34 he entered the Episcopal ministry and chose” … to explore the inland hills and mountains, where life was a test of man’s industry and ingenuity … (and where the Episcopal Church) was emphatically not, as in the coastal areas, “the Church.” The three missions that Dickinson established in upstate South Carolina were St. Paul’s (Pendleton), St. James, Greenville (which was later renamed Christ Church), and St. Peter’s at the South Carolina Armory, six miles south of Greenville on the Reedy River. St. Peters was represented at the Diocesan Convention of 1821, but afterwards seems to have failed. The name does not reappear in Greenville County’s Episcopal church history until 1970. With the recommendation of a new mission in the area, the Rt. Rev. John A. Pinckney and several clergymen met with approximately 30 interested people at St. Francis Church in October, 1968. By December of that year, the group was meeting for services in private homes, eventually moving to an elementary school in the area. The Rev. Rogers Harris became the priest-in-charge on January 1, 1969. St. Peter’s Church, Episcopal was officially organized on October 24, 1969 with Bishop Pinckney present. There was a membership of about 35 and an elected vestry of nine. On August 3, 1969, The Rev. Henry L. Heath, Jr., from Alabama, became the next priest-in-charge. 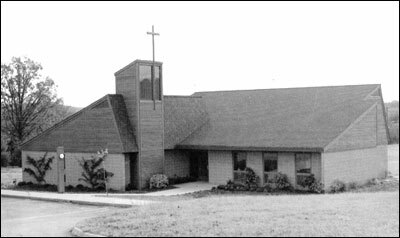 The mission took on new growth and was organized as St. Peter’s Episcopal Church on October 24, 1969, with then Bishop John A. Pinckney present. In February 1970, it was officially recognized by the Diocesan Convention. By June 1973, a move was made to Brushy Creek Elementary School for more space for Sunday School classes. Fairly early in St. Peter’s history, 6.5 acres of land were purchased with the aid and cooperation of the diocese and Christ Church in particular. Ground was broken on February 10, 1975 for the permanent location of St. Peter’s at the comer of Devenger and Hudson Roads. The Rt. Rev. George Alexander, Bishop, and The Ven. William A. Beckham, Archdeacon, dedicated the church building in a service of Thanksgiving on September 7 of that year. What is now Stockstill Hall was the original worship space. A faded green trailer served as the first nursery. In 1976, the Women of St. Peter’s was formally organized. Meta Armstrong became its first president. The Rev. Marshall O. James assumed duties as Vicar of St. Peter’s in August 1981. In February 1984, the church achieved parish status, and called The Rev. James to be the first rector. In October 1985, The Rev. Eric Schnaufer came to St. Peter’s from Dublin, Georgia. The Rev. Jack Hardaway was St. Peter’s first assistant from June of 1995 to November of 1997. The Rev. Mary Moore Roberson answered a call to St. Peter’s in 1999 and assisted for four years. Deacon Steve McDonald served at St. Peter’s from 1991 until Lent, 2003. In fall 1987, the worship area and classroom space almost doubled in size through a major building expansion. The congregation had increased in membership to 160 communicants. Rapid growth resulted in three Sunday morning services, as well as Sunday School. Plans were developed for additional expansion. In 1992 the administrative offices, chapel, and present nave were completed and we continued to grow. In 2008 renovations were completed in the Chapel of the Holy Family. In 2000, the Segars Pavilion, in honor of E. Harold Segars, Jr., was constructed to shelter parish picnics, as well as youth and parish family events. in 2001, building renovations created space for an expanded and upgraded kitchen. The parish was blessed with Craig Piepho as its organist/choirmaster in 2001, after a decade of service by Freeman Orr. St. Peter’s implemented a strategic plan for mission in 2001 and began to turn the plan into action. In 2002, Adult Christian Formation expanded, Vacation Bible School gained momentum, and nursery facilities grew. Parish support for youth activities has grown in innovative ways and our youth groups are flourishing. The St. Peter’s Players (our drama group) has performed for the parish, the community, and the diocese! In April of 2010 Fr. Eric retired after 25 years of dedicated service. Although St. Peter’s was without its beloved pastor and leader of so many years; it was not without hope or direction. Thanks to Fr. Eric and many faithful lay persons, St. Peter’s moved faithfully into the transition that was before the parish, inviting the Rev. Richard Grimball to assist throughout the summer of 2010 during his time off from serving as the senior chaplain at Christ Church Episcopal School. In May 2012, The Rev. Furman Buchanan was called to serve as Rector, to lead the parish to continue living and serving as One Body of Transformation, Embracing all People through Christ’s Love!